You can now update SPJS-Utility.js to fix this problem. Please note that these functions are undocumented and mostly used internally from the different SPJS functions and solutions. If you are interested in using these functions in your own code, dig into the code to discover how it works, or ask a question in the forum. If you are happy with the default, English text, you can skip this next step. 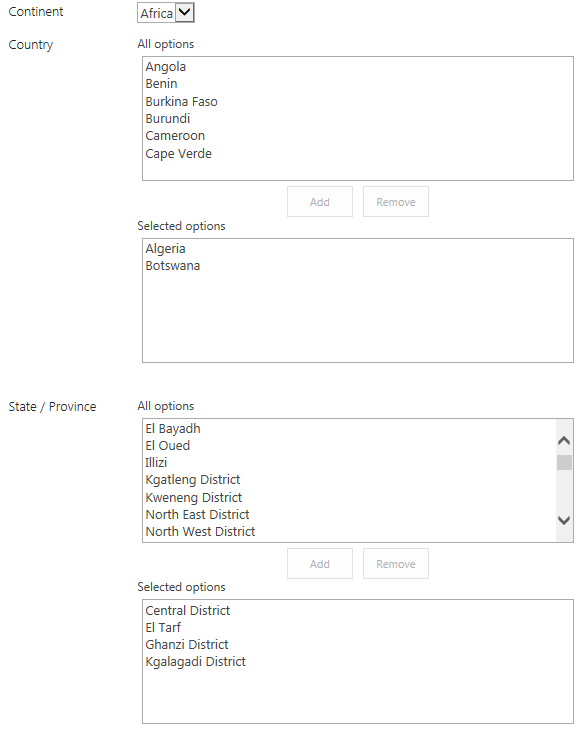 I have updated the cascading dropdown solution to support multi choice in all positions. Refer this article for setup instructions and background information. If you plan to use this with DFFS you must update to DFFS backend v4.259 to support the “:multi” suffix in the cascading dropdown configuration. If you do not already have a forum user, look at the sticky post Register for a user account. Please note how the headers are moved to the side-by-side column using the “Header ID”. Please note that this version is BETA and is NOT intended for a production environment. I have released a new BETA version (v4.210 BETA) of DFFS, but I need help testing it as I have made some fundamental changes to how “initial values” are retrieved, and to how read only fields are “styled” to maintain the correct width of the field. There are also a quite a few bugfixes and other changes that I would like your feedback on. Changed how read only fields are “styled” when using side-by-side to try to maintain the width of the field. This change needs testing – let me know how it works in your setup. Changed how initial value is retrieved when the form loads. Previously DFFS read the values from the fields using the function “getFieldValue”, but now it uses a web service call to get the current item metadata from the DB. This is done to try to overcome the problems some have been experiencing with people pickers not being ready when set to readonly when the form loads. This change needs testing – let me know how it works in your setup. Changed how you reorder fields in tabs in the backend. Boolean values will be displayed as checkboxes in DispForm. New: Changed tab color on hover to a slightly lighter color (update CSS file for the frontend). 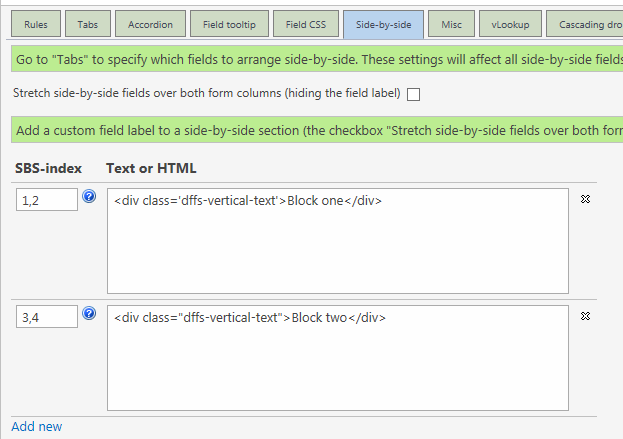 Added class “dffs-accordion-activePanel” to active accordion panel. You can use this class for your “custom code”. New: Added support for comparing dates with hours and minutes. Please note that you cannot use hour and minute when comparing dates in DispForm. 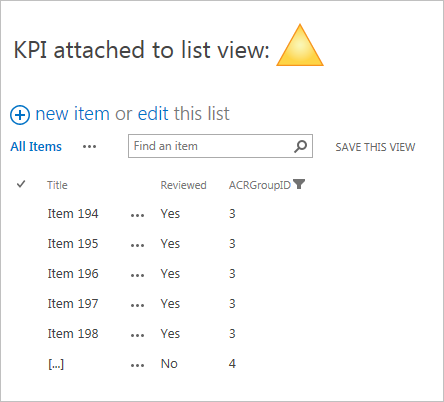 New: You can now add a new field to the list from the Misc tab (SP 2010 and 2013 only). 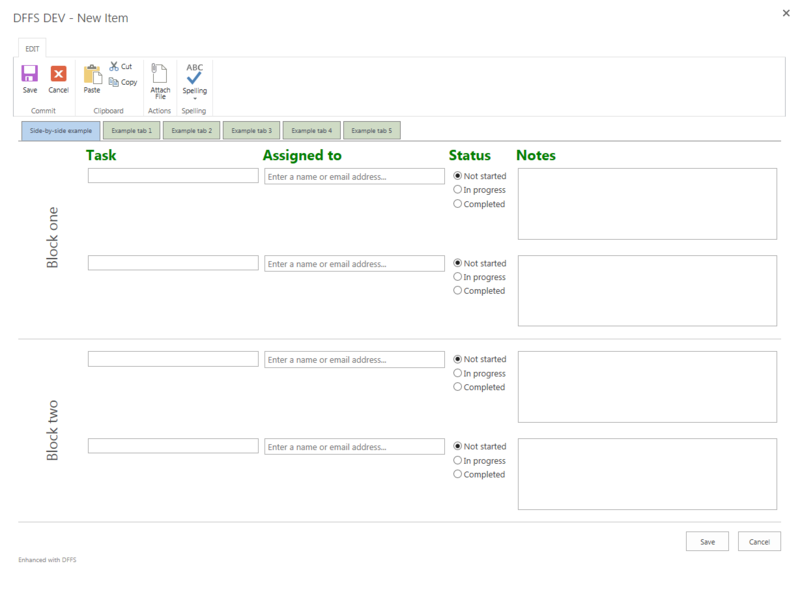 When no configuration has been created for a form, the overlay would time out with “This took forever”. When using side-by-side and hidden label you could got a linefeed after the star that indicates that the field is required. 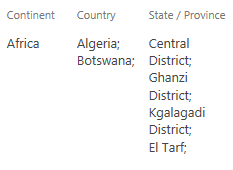 Selected tab index trigger: added “change event” as this trigger only fired on load and not on change of tab. Only the first rule using the trigger “Selected tab index” could be used in “and these rules are true”. The rule debug output was missing “run these functions”. Date pickers: In some cases, errors would appear in the developer console in SP2013 when operating date pickers. Date pickers: The “blur” event was not triggered on the “master” datepicker when using “linked” datepickers and modifying the “slave”. When a field was configured in DFFS, but it was not in the current content type, you could in some cases get an error like “unable to get the property “hidden” of undefined or null reference” in the developer console. The Attachement field will no longer trigger the “orphans” tab. In the frontend I have changed from referring jQuery as $ to use spjs.$ due to an error in SharePoint when using rich text fields and “Insert > Link > From SharePoint” as the file “assetpicker.js” will “kill” jQuery by overriding the global $ variable. This would result in a complete halt in all the functionality in DFFS (and other plugins using jQuery). Please note that other plugins must also be updated. Look at the change log for each one to see which one have been updated. Scroll to first input will no longer make the form scroll down. If the first input is off the visisble sceen, it will not get focus. BETA 2: Fixed bug occurring when you for some reason had duplicates of the configuration in the configuration list. Now only the first “match” will be used, and you will no longer see duplication of rules and tabs. BETA 2: Fixed a bug where “rule messages” did not show for readonly fields. BETA 2: Fixed a bug in setting field value for a date only field when this is read only. It will now show date only and not date and time. Please note: You must also update spjs-utility.js to v1.200 or later. Follow this link, and ensure you get the latest version. PS: The files are uncompressed, therefore the files are bigger than the production release. Please post any findings or questions regarding the 4.210 BETA in this topic in the forums. Unfortunately I have not been able to test this as thoroughly as I wanted, but I could not wait any longer to make it available. Post any findings to the forum, and I will fix the issues as soon as I can manage. The more of you that gives feedback, the faster the production version will be released! 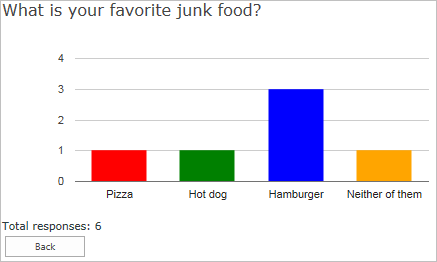 I received a question about the built in KPI in SP 2010. The user added the KPI to a list view that was filtered with a Query String Filter, but the KPI didn’t respect the filter and kept calculating based on the unfiltered view. // Target view - must be filled in to use "consumeFiltersFromList"
Update the link to the file “SPJS-KPI.js” in the code example. placeholderID: This is the ID of a HTML element in the page where you want the KPI to appear. 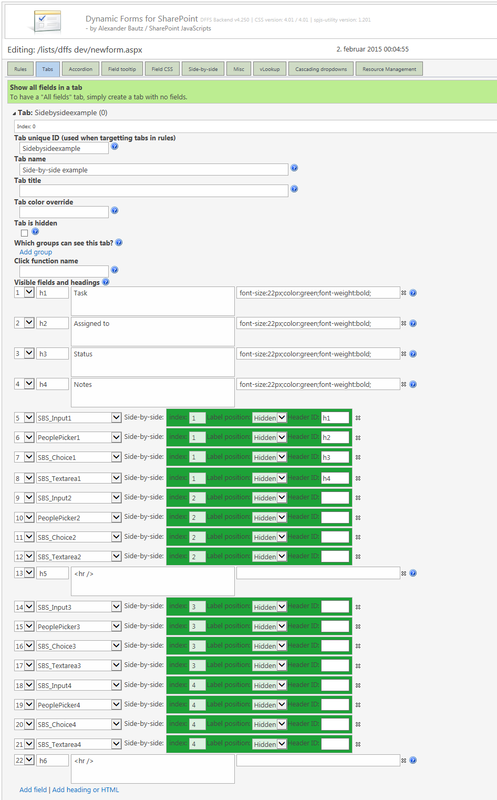 listGUID: This is the list GUID of the list you want to attach the KPI to. If you are using a list view from the list itself (not a web part page), you can use the variable from the example. If not, add the GUID to the list here. To find the GUID, go to a list view, right click and view source. Look for “pageListId”. consumeFiltersFromViewGUID: To have the filter consume the filters from a list view, add the GUID of the view you are applying the filter to here. Find the list GUID by filtering the view and look at the URL. In SP 2010 you see “View=xxxxxxxx-xxxx-xxxx-xxxx-xxxxxxxxxxxx”, in SP 2013 you see it like this: InplviewHashxxxxxxxx-xxxx-xxxx-xxxx-xxxxxxxxxxxx. The GUID is where the x’es are. URLfilterTargetField: This is the FieldInternalName of the field in the list where the filter is applied. kpiIndicatorField: This is the FieldInternalName of the field you calculate the KPI from. kpiIndicatorFieldValue: This is the value found in the field you calculate the KPI from. If it is a Yes/No column, use boolean value true or false. greenThreshold: The percentage needed to show the green icon. yellowThreshold: The percentage needed to show the yellow icon (the rest is red). greenIcon, yellowIcon and redIcon: URL to the images. Ask if you need help or you find a bug.